it’s a multiaxial synovial “ball and socket” joint. in other words, it can rotate in all directions more or less, and contains fluid (synovial fluid) which lubricates the joint capsules. this is where you start talking about an impingement. an impingement is basically when the soft tissues underneath the acromion bone are pinched and restrained as they move under the acromion itself. pain is felt and that distinct “pinching” sensation, like something is catching in your shoulder and preventing you from moving your arm properly. to clarify, this is the bone structure (link courtesy of wikipedia), take note that the shoulder blade folds right back to the front onto the clavicle. 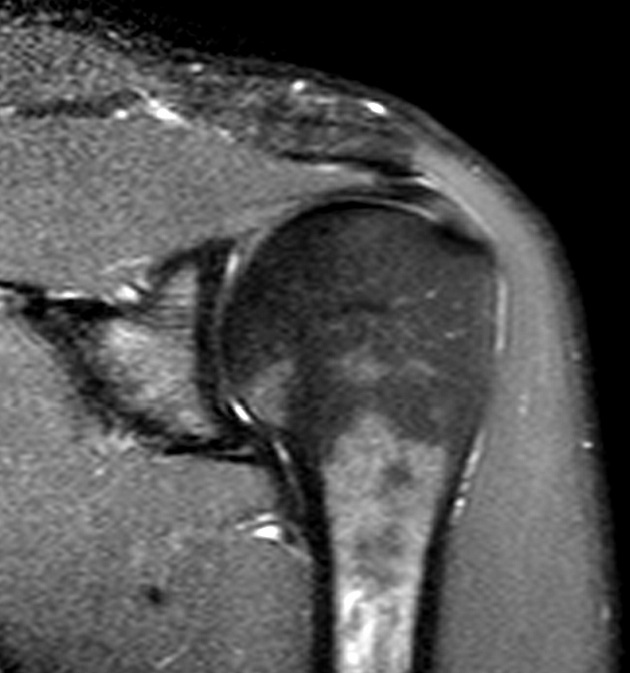 the little space between that junction and the humeral head beneath is where all the tricky tendons go… bit cramped! the more you try to move and be active/train, the worse the inflammation becomes until eventually, like me, you become utterly unable to lift your arm beyond shoulder level without copious amounts of pain. before getting to that, i had cortisone injected in both bursas (right and left shoulder, lucky me). which gave me instant yet ephemeral relief (the right hand side took longer to get better but it was a more lasting change, am still feeling an impingement but i have almost 100% mobility). apparently the fact that cortisone helped was an indication that it was to do w the acromion. my consultant feared slap tear w potential damage to the rotator cuff muscle but luckily this wasn’t the case for me. this is what we saw originally in november. altho the NHS radiologist ruled out an inflammation of the bursa, everyone disagreed with him, including the head of the shoulder dept at the Whittington Hospital, Mr Hamilton, his colleague Mr Haddo who performed my surgery and my physio James Wellington who deals w all the circus ppl injuries at the Circus Space in London. by the time the nhs got their rear end in gear, it was already january and i had made it MUCH worse by then. so i got back to my consultant and we proceeded to booking me in for surgery. at this stage, without taking a look via arthroscopy, it was impossible to tell what the matter could be. could be as simple as a subacromial decompression but we could also be looking at a torn rotator cuff or a slap tear. it was all a big surprise waiting to be revealed. so when i woke up and saw my notes saying i had “just” had a subacromial decompression, i was relieved. having said that, it’s not just a walk in the park either. my shoulder aches, like it’s been repeatedly run over by a big truck and bashed w a sledgehammer to finish it off. just now am i beginning to feel more normal in there. the nerve block they gave me wore off in about 12 hours. cue INTENSE pain. cue codeine. cue coma. i weaned myself off the codeine in a few days as it enabled me to sleep better at night (the discomfort at night is worse, lying down seems to put the humerus in a funny position regardless of whether you’re a back or side sleeper). but now i am only wearing the sling when i leave the house so ppl know better than to bump into the shoulder. physio exercises are very basic for now. pendulum, theraband exercises without the theraband and using a stick (or a bike handlebar in my case) to bring your arm up and down and sideways basically. this is to avoid frozen shoulder for lazy ppl who wear the sling all the time, or for those who can’t quite take the pain. my shoulder is free most of the day and constantly in motion (i hope) so the synovial fluid should keep lubing that joint nicely. in terms of training, i haven’t started doing anything on this arm yet. hell i still have stitches! but i can lift my arm using only its own muscles quite ok (very painful but doable) and do my dishes by myself.